Your pure heart and patient nature will shine through when you wear this Harry Potter Hufflepuff Infinity Scarf. Inspired by the kind-hearted and earnest Hufflepuff House members, this infinity scarf measures approximately 81-inches long and is connected into an easy-to-wear loop that'll fit just about any Harry Potter fan. 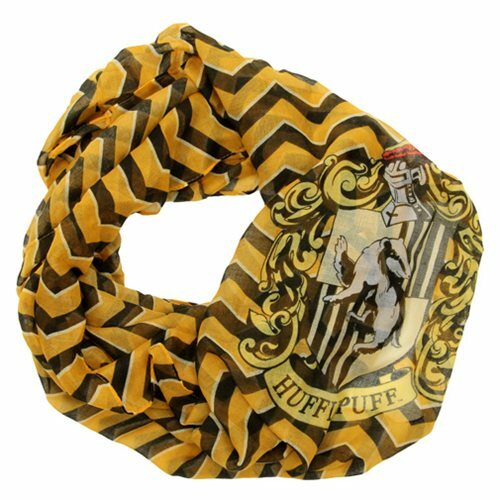 Made of high quality yellow polyester and striped with black and gray, this infinity scarf is fully detailed with Helga Hufflepuff's badger coat of arms. This 100% polyester scarf is perfect for everyday wear. Ages 14 and up.